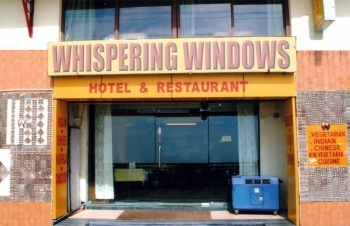 Hotel Windors Whispering Windows is a deluxe property in Mussoorie offering a perfect escape from the mind wrecking hectic life in the company of nature in Himalayas. The breathtaking views and peaceful retreat makes its best among budget accommodations in Mussoorie town. The hotel is strategically located near Gandhi Chowk on the main Mall Road in Mussoorie. The location is quite accessible and offers spectacular view of the green valley and down-hill verdure. There are some Tibettan market stalls nearby hotel selling artefacts and low price clothes which is often attracted by he tourists. The hotel accommodates 18 well furnished rooms in its premises full of refreshing vibes and neat clean surroundings. The room are well-appointed with round the clock room service, intercom, attached bathroom, sofabed, etc. The deluxe hotel owns a multi-cuisine restaurant which serves deleactable Indian, Chinese, Mughlai dishes to its guests. The hotel offers comfortable accommodations in the price range of Rs 1200/- to Rs 4200/- per night. By Road : Mussoorie is 296 kms away from New Delhi and can be easily reached by following the New Delhi-Ghaziabad-Modinagar-Muzaffarnagar-Dehradun-Mussoorie which will take near about 5 hour 50 minutes to reach the refreshing queen of hills. The local bus stand is 3 kms away from the hotel. Airport : Mussoorie can be reached by boarding a flight from any part of the country to the Jolly Grant Airport which is the nearest airport located in Dehradun. The airport is 65 kms from Mussoorie.